Seven faculty members, graduates of and residents at the Northern Ontario School of Medicine (NOSM) have been honoured with awards from the College of Family Physicians of Canada (CFPC) and the Ontario College of Family Physicians (OCFP) ahead of the groups’ annual Family Medicine Forum (FMF) conference this week. Dr. Dieter Poenn, NOSM Assistant Professor, the 2018 Reg L. Perkin Family Physician of the Year award from the OCFP. The award is the college’s highest honour, presented annually to a family doctor who provides exceptional care to patients, while significantly contributing to the health and well-being of communities and society. Dr. Grant McKercher, NOSM Assistant Professor and former NOSM PGY3 Family Medicine Care of the Elderly Enhanced Skills Program Director, received the 2018 CFPC/Canadian Geriatrics Society (CGS) Award of Distinction in Health Care of the Elderly. This award recognizes Canadian family physicians in active practice who had made substantial contributions to the high-quality, patient-centred care of Canadian seniors. Dr. Lianne Gauvin, NOSM Assistant Professor and charter class graduate, received the 2018 OCFP Community Teacher of the Year Award. 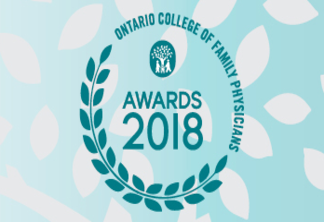 This award celebrates excellence in a community family medicine preceptor, and is nominated by Ontario’s family medicine residents and medical school students. Dr. Reid Cameron, a graduate of NOSM’s Family Medicine Residency Program, received a 2018 OCFP Board Award of Merit. This award recognizes ongoing contributions to the profession of family medicine through comprehensive and compassionate medical care, continuity of care and an unwavering commitment to the health and wellbeing of patients. Dr. Lynne Schwertfeger, NOSM Assistant Professor, received a 2018 CFPC Award of Excellence. The Awards of Excellence recognizes outstanding contributions in a specific area pertaining to the specialty of family medicine. Dr. Ryan Patchett-Marble, NOSM Assistant Professor, received a 2018 CFPC Early Career Development Award and the Team Williams Family Medicine Innovation Grant. The Early Career Development Award recognizes the efforts of new family physician leaders for their outstanding contributions to their field. The Team Williams Family Medicine Innovation Grant supports family physicians and family medicine residents in the creation and development of innovative medical IT projects in family medicine. Dr. Chelsey Bertrand, NOSM Family Medicine Resident, received the 2018 CFPC Indigenous Medical Student Leadership Award. The Indigenous Medical Student Leadership Award recognizes the leadership abilities of an outstanding Indigenous student at one of the 17 Canadian medical schools. The winners will be presented with their awards at ceremonies held throughout FMF.